Size: 14", 16", 18", 20"
Capitalizing on the ability of our skilled personnel, we are keenly instrumental in delivering a comprehensive array of GI Ghamela.
" Ghamela made from premium quality CR and GI/GP sheets. Sizes available from 14 inches to 22 inches, with flat and round edge. 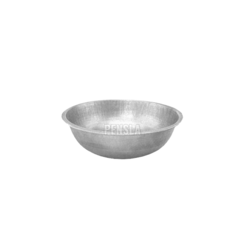 Available Size: 12", 14", 16", 18", 20"
We offer to our honored patrons the first-class range of Galvanized Iron Tasla. Furthermore, our patrons can avail this product from us at affordable rates. We take pleasure to introduce ourselves as one of the renowned firms for providing the best-in-class range of Galvanized Iron Tasla. In order to fulfill the ever changing demands of our clients, we have been engaged in offering a quality range of Galvanised Iron Ghamela. 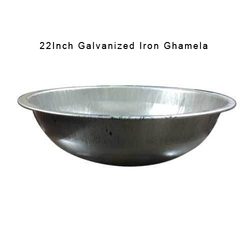 The offered range of Galvanised Iron Ghamela is developed using iron, sourced from trustworthy vendors of market. This range of Galvanised Iron Ghamela is available in different customized forms and specifications as per the demands of the clients.